At Aqua Lounge in Newport Beach, your drink would sprout a pair of legs and walk across the catwalk-like, aqua-blue bar with a cocktail-shaken strut if it could. Although I deeply appreciate the world of fashion as a self-proclaimed addict of Project Runway, I can’t help but feel like Michael Kors sitting at the bar…sunglasses on, judging each drink with a catty-like snark. Luckily, the drinks are in full summer fashion. I order up a Flower Bomb with a Tim Gunn quote, “make it work!” and what I get back is something I expect to be Betsy Johnson in approach, yet is 1995 Calvin Klein in execution—that is to say, tastefully minimalist with a tasteful flower garnish. The potion is vodka, passion fruit, lime, agave nectar, and grapefruit liqueur inspired by Victor & Rolf’s Flowerbomb fragrance, which is equally as worthy of a neck dab. 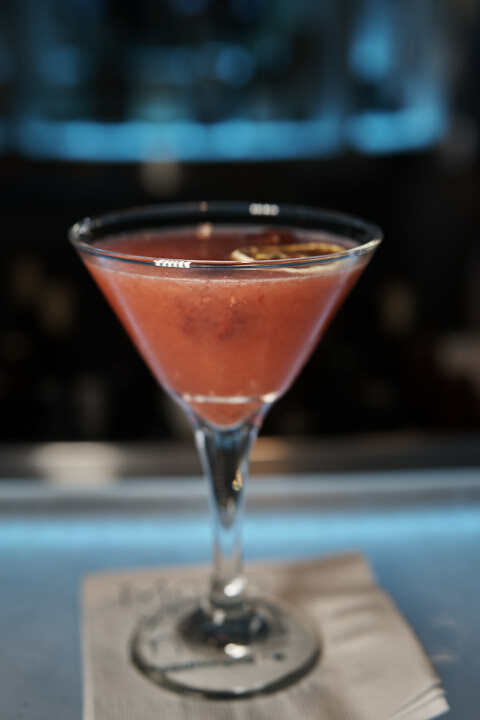 Seated next-door to Fashion Island, the Fashion Island Hotel boasts two bars with a split personality. Aqua Lounge, which is both your after-work happy hour hub and late-night party lounge, and, step’s away, the Oak Grill, which serves as the hotel’s dining hub, with an open-airy feel and plenty of comfy alfresco areas to lounge and grab drinks and bites. Oak’s bar is also the place to catch a game, with usual bar guests sipping craft beers and cocktails furthering the fashion-forward feel of the hotel. Sticking with the fragrance theme, I order a Coco No. 5 at Aqua Lounge and eyeball the heaping mound of tacos my bar mates are indulging in. Tuesdays are all about $2 tacos during happy hour, but I resist the urge as I need to keep a keen eye on my David Beckham-like dadbod. Chanel No. 5 is one of those fragrances that I bought for a special someone, and the drink surprisingly does it justice. It’s floral without being perfumy and jammy. 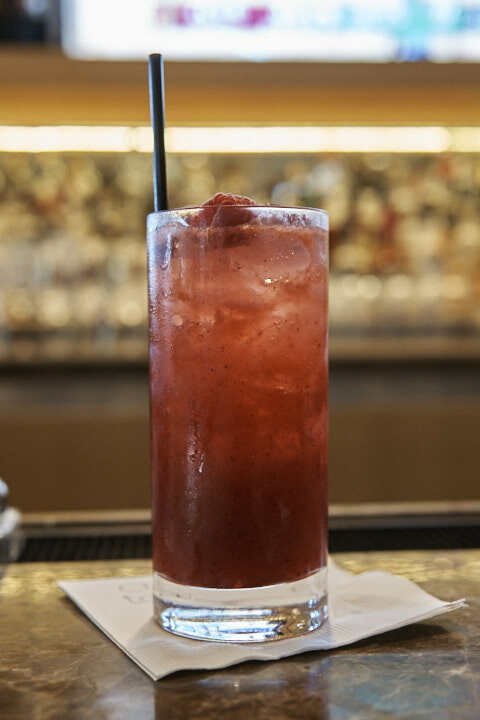 Oak Grill’s collection of drinks have that ‘refreshing summery cabana’ vibe, with cocktails like The Boss (named after fashion icon Hugo Boss), which is somewhat similar to Coco No. 5 but served in a sudsy Collins glass. If you’re feeling a bit Culture-Clubby, The Boy George is fun; the drink is shaken and poured over a dollop of pink cotton candy and tastes like boozy pink lemonade. 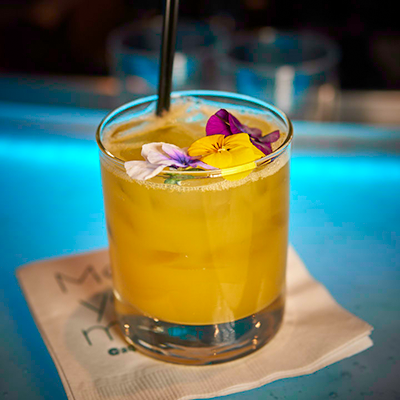 If you’re in the mood for a margie, their Bidi-Bidi Bom Bom is Oak’s take on a skinny margarita, but spiced up with Liquid Alchemist’s ginger syrup and a hint of mezcal smoke.